A gorgeous display of creamy white and purple blooms. Masses of cream and purple blooms for 5 months. Attracts butterflies and other insects to your garden. Easy to grow and maintain - no fiddly pruning. Supplied as an established plant in a 7cm pot. Clematis sieboldii 'Florida' will fill your garden with a riot of glorious double blooms from June to October - 5 months of fabulous flower power every year! The large flowers are highlighted with a flush of minty green and carry a central cushion of fluffy petals, making them a really exotic addition to your garden. A sun lover, this double-flowered beauty enjoys a sheltered spot in the garden and will be covered in creamy white blooms with a purple centre - sometimes reverting to the occasional all-cream flower so the plant looks even more striking. Plus, as they're relatively compact, growing to just 6-8 ft, they're ideal for growing in a favourite container to make a stunning feature on your decking or patio. Supplied as an established plant in a 7cm pot ready to be planted out or potted on. 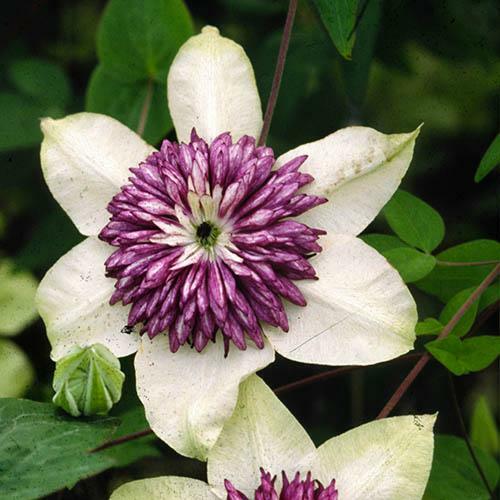 Plant with the crown of the plant 5-8cm deep to encourage new shoots to grow from below ground level.Clematis like a cool ‘root run’ so try and plant so that the roots are shaded. If you are planting in a sunny position, place some pieces of slate or flat stones on the soil after planting or use groundcover plants to keep the roots cool. Feed in spring with a general-purpose feed, avoiding the stems. Mulch immediately afterwards with organic matter such as well-rotted manure, leafmould or garden compost. Pruning is a case of a simple tidy up - in late winter/early spring simply reduce all stems down to 6' (15cm) of soil level. However, please check the detailed advice on each variety as some differ slightly.